Use these words and phrases to connect the main ideas in your essay. Click on the scroll button in each category to see more examples. 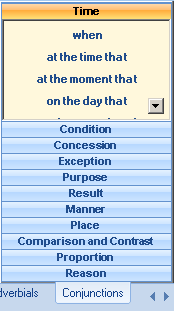 Drag and drop the word or phrase you need into your text. Use these words and phrases to connect ideas within your sentences. Click on the scroll button in each category to see more examples. Drag and drop the word or phrase you need into your text. Use these words and phrases to signal the development of your ideas within your essay. Click on the scroll button in each category to see more examples. Drag and drop the word or phrase you need into your text. Use these phrases when you want to refer back to ideas your wrote about earlier in your essay. Click on the scroll button in each category to see more examples. 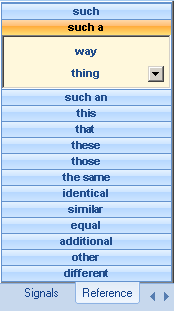 Drag and drop the phrase you need into your text. To see a tutorial on using drag and drop click here.